We are committed to the environmental, cultural and social needs of communities. Children particularly enjoy participating in the cultural activities, For further information about this course please contact Dawn at dawn@nullemuconsulting.com.au or phone: 0481 098 045. Participants will engage in activities, view and learn about the importance of cultural practices, hear Aboriginal people’s personal stories and share experiences. Cost: Course fees start from $2500 per group (maximum 30 people). Cost includes morning tea, lunch and afternoon tea. Venue: This course can be run in house or at a hired venue in Adelaide or the riverland. Facilitators: Dawn Hawthorn-Jackson, Managing Director of Emu Consulting and Major Sumner, a respected Ngarrindjeri Elder. Dawn has worked with many Aboriginal communities and individuals throughout South Australia and Major Sumner is a cultural leader within the Ngarrindjeri nation. To enquire about this workshop please contact Dawn at dawn@nullemuconsulting.com.au or phone: 0481 098 045. We can also tailor a course to meet your needs. This half day course begins with a smoking ceremony, welcome to country and personal story by Major Sumner, a respected Aboriginal Elder. Cost: Course fees start from $1600 per group (maximum 30 people) or $160 per person. Cost includes morning tea and lunch. Venue: This course can be run in house or at a hired venue in Adelaide or the South Australian Riverland. To enquire about this course please contact Dawn Hawthorn-Jackson at dawn(at)emuconsulting(dot)com(dot)au or phone:0481 098 045. Beth Christensen, the Community Development Coordinator at the C.A.F.E Enfield Children’s Centre for Early Childhood Development and Parenting contacted us and requested a meeting to discuss the incorporation of an Aboriginal smoking ceremony at a celebration event at the Centre. We met with Beth to discuss the event and her needs. 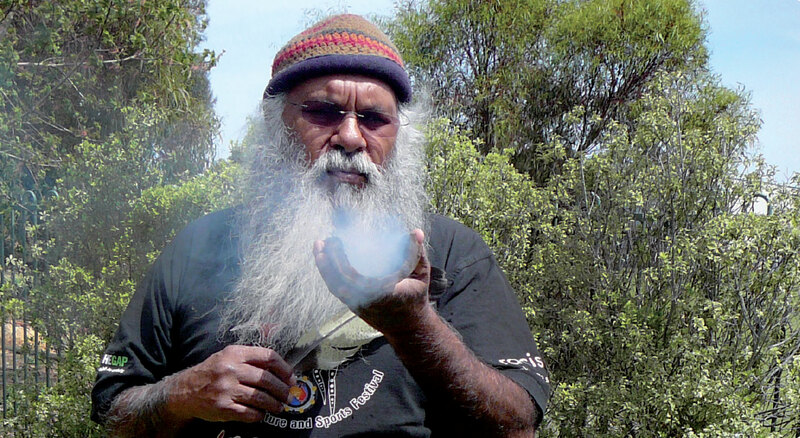 We then organised a smoking ceremony for the Centre which was performed by Major Sumner (Moogy), an Aboriginal Elder. Children, staff, parents and care providers all participated in the ceremony. Dawn also took photos and video footage of the event and provided these to the Centre. The C.A.F.E. Enfield Children’s Centre for Early Childhood website can be viewed at: www.childrenscentres.sa.gov.au/pages/cafeenfield/home. We welcome the opportunity to present Aboriginal cultural ceremonies at events. For further information please contact Dawn Hawthorn-Jackson today at dawn@nullemuconsulting.com.au or phone: 0481 098 045. Henning Bettermann and Sandro Urbani, both German business operators, visited Adelaide and contacted Emu Consulting with a request for Aboriginal cultural awareness training. Major Sumner and Dawn met with them and introduced them to Tandanya (an Aboriginal Cultural Institute) where they experienced a private session with a didgeridoo player and a tour of the Institute. Dawn and Major then took them to lunch in Adelaide’s East End precinct and taught them about the importance of Aboriginal culture to Ngarrindjeri people and Aboriginal cultural educational programs in South Australia (a subject which was of particular interest to them). Henning can be contacted by visiting: www.rtp-service.de. 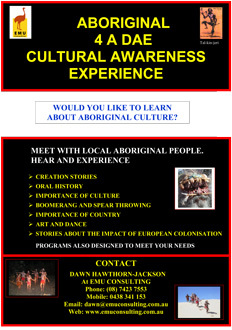 We welcome the opportunity to teach you about Aboriginal culture and country. Emu Consulting was contracted by the Northern and Yorke Natural Resources Management Board to develop Aboriginal Cultural Awareness on-ground training tours. These tours enabled Board and Group members and staff to meet with Aboriginal community members, learn about Aboriginal culture and view land management issues and projects in Aboriginal communities located in South Australia. 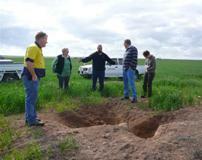 To learn more about the Northern and Yorke Natural Resources Management Board please visit: www.nynrm.sa.gov.au. We welcome the opportunity to assist you with your Aboriginal cultural needs and invite you to contact Dawn Hawthorn-Jackson today at dawn@nullemuconsulting.com.au or phone: 0481 098 045. Emu Consulting was contracted to deliver a ‘Welcome to Country’ for an event developed by the Flinders University Rural Clinical School. This event brings first year medical students together in a forum/workshop setting where they are introduced to programs, guest speakers and medical opportunities and participate in medical practice workshops. The event is held each year in Ngarrindjeri country and as a sign of respect a Ngarrindjeri Elder is invited to deliver the ‘Welcome to Country’. Major Sumner performed the event on behalf of his community and country and Emu Consulting. For further information about the Flinders University Rural Clinical School please go to: furcs.flinders.edu.au/. If we can assist you with your Aboriginal cultural needs please contact Dawn Hawthorn-Jackson today at dawn@nullemuconsulting.com.au or phone: 0481 098 045. Emu Consulting received a call from the Largs Bay Outside School Hours Care (OSHC) Director with a request for us to deliver an Aboriginal 4 A Dae program to children as part of their school holiday activities. We therefore visited the school and undertook a variety of activities with the children and staff. Major Sumner, an Ngarrindjeri Elder, begun the day by talking to the children about dreaming stories that are significant to Ngarrindjeri people. Children and staff then participated in a variety of activities including boomerang throwing, face painting and cultural dancing. Major Sumner also demonstrated the art of spear throwing. Children had the opportunity to relax while watching animated dreaming stories and a film about the traditional practice of canoe making. Children also enjoyed question and answer sessions after the activities and having their photos taken throughout the day. We invite you to contact us to learn more about our Aboriginal 4 A Dae program. For further information please contact Dawn Hawthorn-Jackson today at dawn@nullemuconsulting.com.au or phone: 0481 098 045. General Practices SA Incorporated are committed to providing cultural awareness training to their staff. To enable them to better understand Aboriginal cultural practices, Pre-European colonisation life, the history of European colonisation, facts about the stolen generation and the current health and relationship needs of Aboriginal people, they requested that Emu Consulting deliver a training course to their organisation. Major Sumner (a Ngarrindjeri Elder) and Dawn Hawthorn-Jackson delivered Emu Consulting’s History, Facts, Statistics and Relationships course at the General Practice SA Inc office. The training began with Major performing a smoking ceremony and welcome to country which staff participated in. It then continued with another cultural activity, the sharing of Government policy information, on the ground knowledge, stolen generation stories, health statistics, discussions and a DVD highlighting Aboriginal cultural healing practices. The training enabled participants to return to work with an enhanced understanding of the importance of Aboriginal country and culture and knowledge about how past policy practices have influenced current Aboriginal communities and individual lives. If you would like further information about our cultural awareness courses please contact Dawn Hawthorn-Jackson today at dawn@nullemuconsulting.com.au or phone: 0481 098 045. As part of their launch of a new office in Adelaide, the Australian Red Cross contacted us to request a smoking ceremony to cleanse the building. Major Sumner performed the ceremony on behalf of Emu Consulting and Kaurna country. Staff participated in the ceremony and learnt about its meaning and importance. For some of the staff, this was the first time they had participated in a smoking ceremony and many of them reported that it was a spiritual and moving experience. In 2013, the Australian Federal Government in association with the South Australian Department of Premier and Cabinet hosted the Office for Security Cooperation in Europe (OSCE)–Australia Conference on “Improving the Security of Women and Girls”. The organisers of this event appreciated the importance of presenting a Welcome to Country and Smoking Ceremony prior to the start of the conference and contacted us to source Kaurna Aboriginal performers. On behalf of Emu Consulting and Kaurna country, Aunty Josie; a respected Kaurna Elder delivered a Welcome to Country and Karl Telfer; a Kaurna Cultural Bearer performed a Smoking Ceremony, during which conference attendees participated. Karl also spoke about the importance and value of women and girls in Aboriginal culture. Members of the conference found both performances highly moving and very much appreciated learning about Aboriginal culture and country. Photo kindly provided by Chesser Studios. Emu Consulting welcomes the opportunity to share our experiences with your organisation. Please feel free to contact us at: dawn@nullemuconsulting.com.au or on 0481 098 045. I look forward to receiving your enquiry and assisting you with your consulting needs.